I Simply Guarantee This To Be One of the Most Important, Advantageous and Time Sensitive Books You'll Ever Read Or Your Money Back! My Main Concern Is That You Get This Book!!! You'll learn what God calls the United States of America, how He describes her and why you need to be concerned. You'll learn what God thinks about the United States of America. This will literally shock you to your core. You'll learn about a likely merger of the U.S., Cananda and Mexico and how will this affect you and change America forever. You'll learn what prophetic significance can be found in the Oklahoma City bombing, 9/11 and Hurricane Katrina. You'll learn of the prophetic significance of the increase in terrorism in the U.S. and how it is likely to continue. You'll learn that nuclear terrorism is likely to be in America's future. Our leaders say that the current war on terrorism could last generations; you'll learn who the likely winner of this war will be. You'll learn why other nations hate the United States and why you should care. You'll learn if the U.S. is truly on the side of righteousness or whether it is actually on the side of unrighteousness. You'll learn if America will continue to be a safe haven for Christians or whether it will become one of the worst persecutors of Christians in world history. You'll learn what role the U.S. will play in the coming New World Order (NWO) or one-world government. You'll learn who will lead the soon coming NWO. You'll learn how a one-world religion is now being planned and further what role the U.S. will play in this one-world religion. You'll learn what the mark-of-the-beast will be and where America will stand when the mark-of-the-beast is established. You'll learn how to recognize the mark-of-the-beast. You'll learn how to avoid the mark-of-the-beast. You'll learn who or what the AntiChrist is. You'll learn just how close the Tribulation is using historical events that fulfilled the words of Jesus. You'll learn the special message that God put in the Bible for Americans. You'll learn what you should do in order to receive God's blessings, provision and protection during the soon coming tribulation to come upon America and the world. You'll learn that the judgment of God is coming on America and what you should do in order to be saved from this coming judgment of God. This dynamic life changing and life saving two volume eBook is packed with the most timely and important information about America's future and it only requires a Donation in the amount of your choosing - You determine the price. Your donation is even backed up by a 30-day unconditional money back guarantee. You have nothing to loose and everything to gain! Many today are awaiting the return of Jesus Christ and the fulfillment of Bible prophecy. They are looking for signs in the heavens and the earth. They are looking for evidence of end-time events in the global news. They are looking for signs that we are in the end-times (the last days), that the tribulation is about to begin and the antichrist revealed. But very few are looking for any events concerning the United States. This is because very few are informed about what Bible prophecy says about the United States. In fact it is a common but incorrect belief that the U.S. is not mentioned in Bible prophecy. As a matter of fact, end-time Bible prophecy has more to say about the United States of America than any other nation. 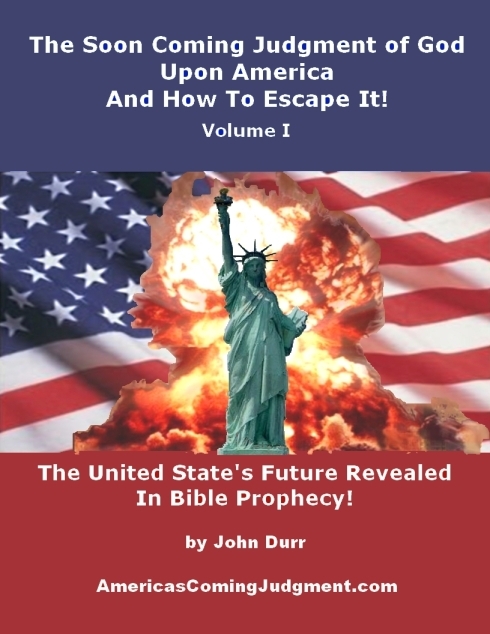 This eBook is a Revelation Warning Concerning the United States of America From God's Word. The eBook is entitled "The Soon Coming Judgment of God Upon America And How To Escape It!" You'll be amazed at what God has to say about the United States and how accurately He describes her in Bible prophecy. For the first time, America's little known history is used to prove America's place in Bible Prophecy. This little known history is well documented using hundreds of published books, articles and documentaries as sources. Most Bible prophecy teachers say that America is not found in Bible prophecy. Therefore, there are very few other books that accuratly portray America's place in Bible prophecy. Mine is the only one that documents and proves it with America's little known history. Most but not all of the prophecy books available are based on an understanding of prophecy that predates the founding of the United States. Some books are based on more resent understanding of Bible prophecy but they still predate America's emergence as a Super-Power in 1945 and more recently as the lone Super-Power in the 1990s. Bible scholars of past centuries didn't fully understand end-time prophecy because God had sealed it. God said that the prophecies concerning the "time of the end" were sealed up until the "time of the end." The Prophet Daniel had a vision of the "time of the end" and he pleaded with God for understanding. God responded: "Go thy way Daniel: for the words are closed up and sealed till the time of the end" (Daniel 12:9). God also said that during the "time of the end" knowledge would increase (Daniel 12:4). This increase in knowledge includes an increase in our understanding of Bible prophecy. You can increase your knowledge and understanding of Bible prophecy by reading this eBook. If John had written the book of Revelation today, don't you think it would be interpreted differently than it was nearly 2,000 years ago. When John wrote Revelation there were no guns, cars, planes, tanks, jet fighters, computers, satellites, missiles, or nuclear bombs. John didn't even have words to describe these things. Neither was there any United States. The book of Revelation was written for today. I'll show you what God says about the United States of America and more importantly what He is calling Americans to do. This is a very very important message and God wants YOU, YOUR FAMILY and FRIENDS to hear it! The "time of the end," which God spoke of to Daniel, is now. God is speaking to His chosen vessels today just as He promised and He is revealing much about America! Our Lord God said He would do nothing without first revealing it to His prophets (Amos 3:7). God is speaking to men and women today but you probably have not heard His message. This is because these men and woman have a difficult time finding a Church that will let them speak. The Dreams and Visions of these men and women reveal the coming judgment of the U.S. by God. These Dreams and Visions match up perfectly with the prophecies found in the Book of Revelation as I reveal in my eBook. Look what Attorney Andrew Stunich had to say about my book. I am a Christian. I am an attorney... I am writing to thank you for your work on exposing the truth about Mystery Babylon/America.... I have been researching the true factual background about America for several years. I believe what you have written is truly inspired of God and is 100 percent accurate... I am telling all my friends and family about your work and begging them to read it... Thank you so much and may God be with you and continue to bless you and prosper your work. Joseph, the son of Jacob, was an interpreter of dreams. But he was only able to interpret dreams through God. He was only able to interpret Pharaoh's dream in Egypt after God gave him the interpretation. The Prophet Daniel was also an interpreter of dreams. Like Joseph, he was only able to interpret dreams through God. Daniel was only able to interpret the meaning of King Nebuchadnezzar's dream after God gave him the interpretation. Daniel could not even interpret his own dreams. He agonized and prayed about a dream concerning the "time of the end." Daniel couldn't figure it out on his own and God did not give him an interpretation. God sealed it up. As you see, only God can interpret Bible prophecy through His Holy Spirit. Further, end-time prophecy was sealed-up until the time of the end. This does not mean that we wouldn't have some understanding but that God would not reveal full understanding until the end. The time of the end wasn't hundreds of years ago, it wasn't a hundred years ago but we are in that time period today. Since we are in the time of the end, God is giving deeper and more complete understanding of His revelations as He promised. Much of this new understanding of prophecy as it relates to the United States is in my eBook. Your not going to find this same information anywhere else in one source. In Revelation 13 God says that a beast will be identified by the number 666. Most have confused this beast with a person known as the antichrist. A beast always represents a government in Bible prophecy. The beast represented by 666 will be a one-world government which is now popularly called the New World Order (NWO). The leader of the NWO beast will be the antichrist. He will order all to accept the mark of the beast and worship an image of the beast. His false prophet will declare himself to be God even Jesus Christ. But they will both represent the Red Dragon, Satan. They will seek to destroy God's true apostolic church who refuse to accept the mark or worship an image of the beast. Those who refuse to accept the mark and worship the image will only be a small remnant from among Christians. These prophtic events and much more can be found in scripture, in Bible Prophecies. Many of prophecy's end-time events are well known by millions but very few know how the United States is described in Bible prophecy. God wants to change this! That is why He called me to write this book series. It was not my idea! I did not figure this out. God showed me after hundreds of hours of prayer. It was not my intention to write a book, I just wanted to know prophecy better. I was comfortable and content in a very successful career. But when God called I answered. It took 4-1/2 years of full-time work to research and write this prophetic series. I exhausted every asset I had. Every day was and is a walk of faith. This was the hardest thing I ever did. I suffered many horrible personal crises which I attribute to Satan's attacks on me. Satan doesn't want you to know this truth! I didn't give up or quit and now I am able to offer you the book God called me to write. He called me to write it for YOU, YOUR FAMILY and FRIENDS. When you read this two volume prophetic series, you will be brought to a new depth of knowledge concerning Bible prophecy's end-time events, particularly as they involve the United States. You'll discover that America is the Babylon of Revelation 17 and 18. The fact that America is Babylon is very significant because Bible prophecy says that Babylon will be destroyed. This means the United States will be destroyed. It is a judgment from God. This may be the most important book you'll ever read! In this book, you'll receive all the information you need to know in order to be saved from God's coming judgment of the United States of America! This is information that every American needs to know in order to be able to make the right choices that will bring them God's protection, blessings and grace. This eBook is not about what I think; it is about what God thinks. I will reveal in detail the meaning of many Bible prophecies and then I will use little known historical facts and/or current events to prove it is true. You will be utterly speechless and in aw of how literally God's word is being fulfilled today. This eBook is simply the most complete book available on what God has to say about the United States of America in Bible prophecy. This is not a book of prophetic theories. I'm sure your not looking for theories but facts. I'll show you step by step what the Bible says about America and all along the way I'll show you the evidence to prove that it's true. You simply won't be able to read this book and come to a different conclusion. This eBook will also clearly demonstrated from scripture and the word's of Jesus Christ that many living today will witness the fulfillment of Bible prophecy. They will witness the great falling away, the apostasy, the tribulation, the mark of the beast, plagues, World War 3, the apocalypse, Amageddon, the destruction of the U.S. of America and the second coming of Jesus Christ, the rapture, and the new millennium. This parable of the fig tree was fulfilled in 1917 when the Jewish people (the fig tree) began to return to the nation of Israel. My eBook completely explains why this event fulfilled Jesus' prophecy. Now Jesus further stated that after this event occured, there would be signs in the earth. These included: “wars and rumours of wars”, and “famines, and pestilences, and earthquakes, in divers places” (Matthew 24:6-8). This prophecy of Jesus was 100% accurate! I thoroughly document in my eBook how wars, famines, pestilences (plagues) and earthquakes began to escalate in 1917. The documentation is very complete and includes statistics, charts, graphs and the study of many other biblical texts concerning the timing of Christ's return. Now the significance of the 1917 date is very important! Jesus said He would return within a generation of this 1917 event. I'll show you that in Exodus God said a generation equals 100 years. This is very important because 2017 will mark the end of a generation. According this prophecy of Jesus, He will return before the end of 2017. I document the many world events that confirm this in my eBook. Now I'm not setting dates but I am recognizing the time and season in accordance with the Prophecy of Jesus Christ, the Son of God. The timing of Christ's return is particularly relevant to the study of Bible Prophecy. As we see that Christ's return is nearing, we know that all Bible prophecy must be fulfilled in short order! It very very important for you to learn what God says about America! God revealed His prophecies concerning the future of America because He want YOU to know! He wants YOUR FAMILY to know! And He wants YOUR FRIENDS and NEIGHBORS to know! God called me to write this book because He wants you to know the truth. He told me to document everything with historical facts and He guided me all along the way. My book is the only one that proves America's role in Bible prophecy with little known history. This little known history is well documented using hundreds of published books, articles and documentaries as sources. These are very credible but most often little known published sources. You won't find this history in your high school or college text books. You could search it out on your own but it would take you years to track down the hundreds of books that are needed. Many of these books are out of print. You would also need to spend thousands of hours reading. After this you would need to spend hundreds of hours in prayer and many days fasting so that God would give you understanding. In the alternative, you could read my eBook and save yourself time and money. This dynamic life changing and life saving two volume eBook is packed with the most timely and important information about America's future and it only requires a Donation in the amount of your choosing - You determine the price. Look what Steve Knight emailed me after reading my book. God Bless You Mr. Durr and thank you for providing this most valuable information in one resource. There [is] just so much information out there, that one must endlessly do research and piece together the puzzle to even be aware of it... Your book makes that task far more efficient. ...If you had put this in “Published Book” and stopped there, even with references it still would not have the power and impact to educate as it provides in PDF form with those same link's. This dynamic life changing and life saving two volume eBook is packed with the most timely and important information about America's future. I believe everyone needs this so desperately that not only have I committed all my finances to it, it only requires a Donation - You determine the price. Volume one and two each have a retail value of $39.95, that's a value of $79.90 but you can set your own price - the suggested donation is $24.95. If you were to buy all the books and video documentaries I used in writing this book series, they would cost you thousands. It would also take you years to read all those books. But you can have all I learned from the thousands of dollars worth of material I used as sources and the thousands of hours of research for a voluntary donation. Your donation is backed by an unconditional 30-day money back guarantee. If for any reason you are not satisfied with "The Soon Coming Judgment of God Upon America And How To Escape It" you can request a full refund by emailing me with your name, receipt number and donation date. The unconditional 30-day money back guarantee is not valid for donations that are less than $10.00. As a way of saying thank you to all who make a donation to purchase my book, I am including two free gifts. Gift #1 is a compilation of 12 Dreams and Visions of America's Future from genuine men of God. In this eBook you'll also receive links where you can read more dreams from some of these men of God. These Dreams and Visions are further confirmation of what I reveal in my eBook. Gift #2 is entitled Free Books. This eBook has links to hundreds of free resources including free digital Bibles and Bible study resources, free audio Bibles, free Bible software, free Christian newsletters some of my favorite links, free software and much more. The software includes a free office suite and free professional grade photo editing and manipulation software. I include links to over 100 free digital books and links to libraries with hundreds more. I highly recommend many of these books. I used many as resources. Except I didn't have such easy access. I had to search the nations libraries and request many of these resources through interlibrary loans. Now many of these resources are available to download free and I show you were to get them. There was one book that I was never able to get. I was unable to find it in a library. I put a request on 1/2 price eBay and waited for months for one to become available. When one became available, the asking price was $1,000. It is now available online and I'll give you a link were you can get it for free. While compiling several sources of free audio Bibles, I came across an audio Bible selling for over $300 but you won't have to pay this because I'll give you several links were you can get an audio Bible for free. But even without any of these free gifts, my book is worth much more than the suggested donation of $24.95. My eBook is in digital format and must be downloaded. It comes in a PDF format. That means you can have it downloaded in the next few minutes and begin reading it today! Adobe Acrobat is required to read the PDF file. If you don't have Adobe Acrobat, it can be downloaded for free. My download page provides a link to Adobe Acrobat. And How To Escape It!